Consider this an “Open Thread” for sharing thanks, football, family, and the like. Let’s stay away from our pet peeves for one day. I remain thankful that I was born and raised an American, and a Jew in a loving family – the second could not have happened without the first in most places in 1943. I remain thankful for my family of choice as well as for my family of origin, and for my many friends. As my grandfather said, “If you don’t have cancer and the Nazis aren’t kicking in your door, quit complaining.” So I ain’t complaining. Y’all have a fine holiday today. The second revision to Q3 GDP came in at +3.9%, an increase from the initial estimate of +3.5%. Personal consumption rose 2.2%. The core PCE index (which is the inflation measure the Fed prefers to use) came in at 1.4%, so inflation is still well below what the Fed would like to see. The big contributing factor to GDP was government spending, which increased 9.9%. Home price appreciation seems to be flattening, however, as the FHFA home price index was flat on a month-over-month basis. 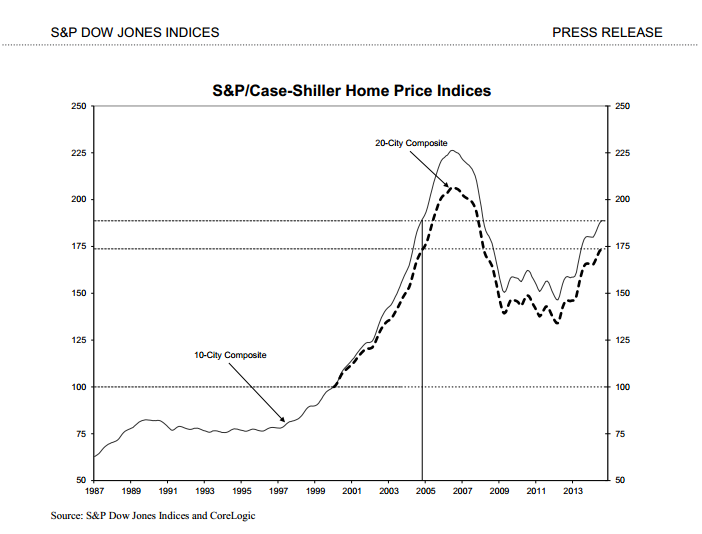 Case-Shiller rose .34%, however. The CoreLogic home price index noted that price appreciation was slowing at the high end, however prices were still rising pretty quickly at the low end (9.4% vs. 4.5%). The big institutional investors are slowing down their purchases of distressed properties, as they have yet to show the huge profits they promised to their own investors. They have a big backlog of homes to renovate and rent, and skilled construction labor is hard to come by these days. I always suspected that the execution of this trade was going to be more difficult and expensive than people were figuring it would be. The Supreme Court will hear oral arguments on the FHA disparate impact case on Jan 21. This is an important fair lending issue, as the Obama Administration moved to make proving lending discrimination as strictly a numbers game – in other words, the CFPB does not have to prove intent to discriminate. If your numbers don’t line up with the population, you are guilty, no questions asked. This one has wended its ways through the lower courts and has made it to the Supreme Court. Stocks are higher this morning on speculation that the ECB will take further measures to boost growth. Bonds and MBS are down. This is a short week with the Thanksgiving holiday. Friday will be an early close in the bond market. We have a lot of data on Tuesday and Wednesday. Economic growth moderated in October, according to the Chicago Fed. Production-related indicators were negative, while employment-related indicators were positive. Even as the Fed ends QE, the demand for sovereign debt remains insatiable. J.P Morgan is forecasting demand for sovereign debt will exceed supply by $400 billion in 2015 as worldwide business confidence drops and inflation remains nowhere to be seen. This has been largely a European phenomenon, however the laws of relative value will affect US bonds as well. 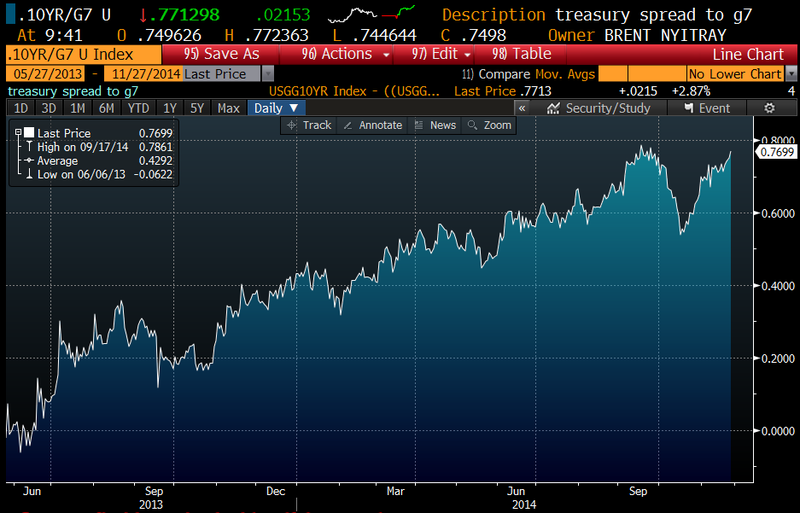 Note that US Treasuries yield more than the G7 average, by a lot. In fact, it has risen from flat to 77 basis points since the Fed announced it would end QE in mid-2013. We are approaching levels not seen since 2006. The upshot? Demand for European debt will keep a bid under Treasuries. In other words, the environment remains suitable for continuing low rates. Interesting that pretty much every strategist on the Street has gotten this one wrong. Fun fact: Of the PIIGS, Italy, Ireland, and Spain yield less than the US. Only Portugal and Greece yield more. It makes you wonder if the Fed and the ECB have created a monster – a sovereign debt bubble. Chart: Treasury spread to G7 debt. (in other words, the 10-year yield minus the average 10 year bond yield for the G7 countries). Obama says that “Americans will want that new car smell and someone that doesn’t have as much mileage as me.” FWIW, Hillary will have quite the amount of mileage on her, as she will be pushing 70 in 2016. But she smells nice, I guess. VLADIMIR PUTIN is not short of problems, many of his own creation. There is the carnage in eastern Ukraine, where he is continuing to stir things up. There are his fraught relations with the West, with even Germany turning against him now. There is an Islamist insurgency on his borders and at home there is grumbling among the growing numbers who doubt the wisdom of his Ukraine policy. But one problem could yet eclipse all these: Russia’s wounded economy could fall into a crisis. Some of Russia’s ailments are well known. Its oil-fired economy surged upward on rising energy prices; now that oil has tumbled, from an average of almost $110 a barrel in the first half of the year to below $80, Russia is hurting. More than two-thirds of exports come from energy. The rouble has fallen by 23% in three months. Western sanctions have also caused pain, as bankers have applied the restrictions not just to Mr Putin’s cronies, but to a much longer tally of Russian businesses. More generally, years of kleptocracy have had a corrosive effect on the place. Much of the country’s wealth has been divided among Mr. Putin’s friends. Everybody expects continued stagnation, but the conventional wisdom is that Mr. Putin is strong enough to withstand this. The falling rouble has made some export industries like farming more competitive. These exports combined with Mr. Putin’s import-blocking counter-sanctions mean Russia still has a small trade surplus. It has a stash of foreign-exchange reserves, some $370 billion according to the central bank’s figures. Add in the resilience of the Russian people, who are also inclined to blame deprivation on foreigners, and the view from Moscow is that Mr Putin has time to manoeuvre. People talk loosely about two years or so. The immediate worry is the oil price. Mr Putin is confident it will recover. But supply seems set to increase, with OPEC keen to defend its market share. American government agencies predict oil prices could average $83 a barrel in 2015, well below the $90 level Russia needs to avoid recession (and to keep its budget in balance). If global demand weakens—Japan has slipped into recession since the latest round of forecasts—the oil price could fall further. That would immediately prompt investors to reassess Russia’s prospects. Then there are the debt repayments. Russia’s firms have over $500 billion in external debt outstanding, with $130 billion of it payable before the end of 2015, at a time when few Western banks want to increase their exposure to Russia. Even firms that earn dollar revenues may struggle to pay their debts. Rosneft, an oil giant, recently asked the Kremlin to lend it $44 billion. Mr Putin has so far resisted, but he cannot let a company that is 70% state-owned and employs 160,000 people fail. There is a lengthening queue of troubled Russian firms. Non-performing loans were rising even before interest rates were raised to 9.5% to defend the rouble. Meanwhile Russian banks are reliant on the central bank to replace deposits that their customers are understandably spiriting into dollars. Directly or indirectly, many of these bills will end up with the Kremlin, which is why its reserves will be vital. They are evaporating: down $100 billion in the past year, following failed attempts to defend the rouble. And the book-keeping is dodgy. Of the reported $370 billion reserve pile, more than $170 billion sits in the country’s two wealth funds. Some of their assets are iffy, including various stakes in Russia’s state-owned banks and debt issued by Ukraine that Mr Putin’s own aggression is fast rendering worthless. One of the funds is earmarked for pensions. In reality, Russia’s government has perhaps $270 billion of hard cash that is accessible and usable without massive cuts elsewhere—less than its external obligations due over the next two years. All this spells trouble for Russia, but Mr Putin’s marauding foreign policy could accelerate things. This after all is a man who has invaded other countries and lied about it. A deeper foray into Ukraine would lead to stronger sanctions by Western countries. Some of them, such as barring Russia’s banks from the SWIFT international payments system, could halt Russian trade altogether. A partial block on oil exports would fell the economy, as it did Iran’s. And the more trouble he faces, the more likely Mr Putin is to play the nationalist card—and that means more foreign forays, and yet more sanctions. If Russia’s economy looks likely to collapse, there will be inevitable calls in the West for sanctions to be cut back. This week Mr Putin pointed out that 300,000 German jobs depend on trade with his country. But Angela Merkel rightly stood firm. Actions, Mr Putin must finally learn, have consequences. Invade another country, and the world will act against you. And the same goes for the economy, too. Had Mr Putin spent more of his time strengthening Russia’s economy than enriching his friends, he would not find himself so vulnerable now. Markets are higher this morning after China cut interest rates. Bonds and MBS are flat. 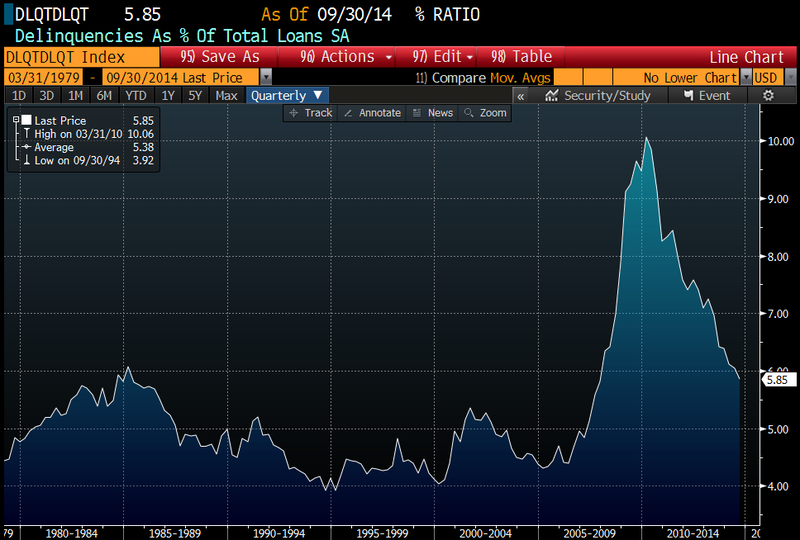 Delinquencies dropped again to 5.44% of all loans, according to Black Knight Financial Services. They are still elevated, but have quite a bit from their high of around 10%. Prior to the the bust, a typical delinquency number was about 4.5%. Foreclosure starts declined 10% in October, and are down 31% year-over-year. Foreclosure inventory is down 33% YOY and is at the lowest level since February 2008. The CFPB is coming down on lenders who ask too many questions about disability income in the verification process. Stocks are down on overseas economic weakness. Bonds and MBS are up. Economic data dump: Initial Jobless claims came in below 300k for the 10th time this year. Lower energy prices are keeping a lid on inflation at the consumer level as the CPI came in flat. Philly Fed made a huge move upward – from 20.7 to 40.8. This is the highest reading in over 20 years. The Bloomberg Consumer Comfort Index rose to 38.5, while the Index of Leading Economic Indicators rose to 0.9%. All in all, some pretty good data this morning – surprising that bonds have taken all this in stride and are up so much. Existing Home Sales rose to 5.26 million in October from an upward revised 5.18 million in September. They are up 2.5% on a year-over-year basis. The median home price was 208,300, which is up 5.5% from a year ago. All-cash sales increased to 27% from 24% in the prior month, but are down from 31% a year ago. Normalcy is around 20% cash sales. The first time homebuyer represented 29% of all sales. Normalcy is closer to 40%. There was nothing earth-shattering in the FOMC minutes yesterday. Everyone agreed that QE had done its job and it was time to end it. They agreed to continue to re-invest maturing proceeds back into the market, and did not discuss suspending that or selling some of their portfolio. The staff economists tweaked their 2015 GDP estimates downward a bit. Since the October FOMC meetings don’t have a press conference of projection materials, they tend not to announce big changes. Bonds rallied on the minutes initially, but sold off to more or less end the day unch’d. Mel Watt testified in front of the Senate Banking Committee yesterday. Elizabeth Warren laid into him about principal reductions on Fannie and Freddie loans. Mel said that reductions are still under consideration. Of course the FHFA Home Price Index (which represents homes with a conforming loan) is within 6% of the high, so if Mel continues to slow-walk principal mods, the problem eventually goes away on its own. They sound like they are bringing back the 3% down conforming loan for “targeted” borrowers. Obama is scheduled to go on TV tonight to tout his new executive order on immigration. Something like 4 million will be given amnesty.